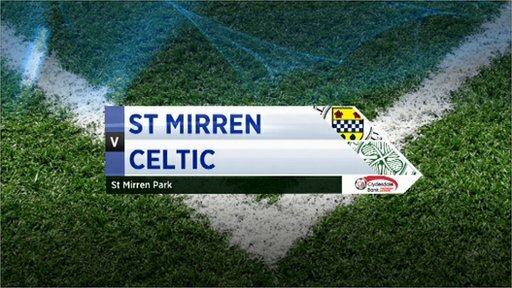 Celtic enjoyed their first win in four outings thanks to a Gary Hooper double at St Mirren Park. The striker opened the scoring in Paisley in the sixth minute after being set up by strike partner Anthony Stokes. Six minutes later a mistake by former Celtic player Paul McGowan allowed Hooper to slip a second past St Mirren goalkeeper Craig Samson. The result moves Celtic to within a point of Rangers and Motherwell. Manager Neil Lennon made two changes to the side who were knocked out of the Europa League on Thursday, with Stokes and midfielder James Forrest replacing Joe Ledley and Georgios Samaras, who dropped to the bench. And Stokes appeared to have opened the scoring when he hit the back of the net in the early stages, but referee William Collum judged him to have fouled Saints defender Marc McAusland beforehand. Celtic's breakthrough came just seconds later when Stokes and Hooper worked a one-two at the edge of the box to allow Hooper to drill the ball past Samson. And things were to get worse for the St Mirren defence when a catalogue of mistakes in the 12th minute, culminating in McGowan passing straight to Hooper's feet, allowed the Englishman to run through and slip the ball into the St Mirren net. But after a poor start, the Paisley side began to show flashes of the brand of football manager Danny Lennon has established in the early part of the season. And McGowan had the chance to make amends soon after his error when Nigel Hasselbaink provided a fine pass, but his effort from 16 yards was saved by Forster. Hasselbaink continued to cause problems for Celtic defender Daniel Majstorovic, with Dutchman Jeroen Tesselaar also threatening to create an opening for the home side as St Mirren increased the pressure towards the end of the first half. After the restart, it was Stokes who again looked dangerous, going on a solo run and sending in a low drive to force a terrific save from Samson. But there were chances for St Mirren too, Tesselaar whipping a free kick round Celtic's wall in the 55th minute; Forster forced to make a scrambling save by his near post. The impressive Tesselaar also did his share at the other end of the park, denying Scott Brown a close-range chance seconds later. Celtic's Kelvin Wilson looked more jittery in front of goal and endured a heart-stopping moment as he sent a defensive header just inches past his own goal in the 66th minute. That fell at the end of a period of sustained pressure for St Mirren, who but for a poor start may have expected more from the game. But in the later stages it was Celtic who looked more likely to add to their advantage, the removal of Gary Teale in the 71st minute restricting St Mirren's creativity in midfield. Ki Seung-Yeung came close in the 78th minute when he found himself one-on-one with Samson inside the box, his low shot blocked by the St Mirren keeper's legs. Forrest also came close with two minutes remaining when he was played in by Charlie Mulgrew but the winger was denied by Samson who delivered another great save at his near post. 90:00+2:05 The match has reached full-time. 90:00+1:48 A cross is delivered by Jeroen Tesselaar, Daniel Majstorovic makes a clearance. 90:00+1:29 Jeroen Tesselaar sends in a cross, Kelvin Wilson makes a clearance. 89:10 Substitution Jim Goodwin leaves the field to be replaced by Kenny McLean. 87:50 Corner taken left-footed by Charlie Mulgrew from the right by-line, Jeroen Tesselaar makes a clearance. 87:33 James Forrest takes a shot. Save by Craig Samson. 87:16 The ball is crossed by James Forrest. 86:05 Free kick awarded for a foul by Steven Thomson on Scott Brown. Beram Kayal takes the direct free kick. 84:18 Substitution Sung-Yeung Ki leaves the field to be replaced by Joe Ledley. 83:41 Corner taken by Jeroen Tesselaar from the right by-line played to the near post, clearance by Sung-Yeung Ki. 83:34 Steven Thomson crosses the ball, blocked by James Forrest. 82:23 Jim Goodwin takes a shot and went wide of the left-hand upright. 81:39 Du-Ri Cha concedes a free kick for a foul on Paul McGowan. Paul McGowan takes the free kick. 81:23 The ball is delivered by Jeroen Tesselaar, clearance made by Daniel Majstorovic. 80:44 The ball is swung over by Jeroen Tesselaar, clearance made by Kelvin Wilson. 79:51 Scott Brown fouled by Joe McKee, the ref awards a free kick. Direct free kick taken by Beram Kayal. 79:10 Substitution Joe McKee joins the action as a substitute, replacing Nigel Hasselbaink. 78:12 Free kick awarded for a foul by Jim Goodwin on Scott Brown. Strike on goal comes in from Charlie Mulgrew from the free kick. 78:00 Sung-Yeung Ki takes a shot. Save made by Craig Samson. 77:17 The ball is delivered by Jon McShane, Steven Thompson takes a shot. Save by Fraser Forster. 75:31 Paul McGowan has an effort at goal from outside the area which goes wide left of the target. 74:25 Inswinging corner taken right-footed by Sung-Yeung Ki from the left by-line. 74:12 Curled left-footed shot by James Forrest. Save by Craig Samson. 73:56 Sung-Yeung Ki decides to take a short corner. 73:46 James Forrest delivers the ball, David van Zanten gets a block in. 72:38 Drilled left-footed shot by James Forrest. Blocked by Lee Mair. 72:09 Corner taken by Charlie Mulgrew, clearance made by Jeroen Tesselaar. 72:03 The ball is crossed by Du-Ri Cha, Marc McAusland manages to make a clearance. 71:29 Anthony Stokes produces a cross, Marc McAusland gets a block in. 70:01 Substitution Jon McShane comes on in place of Gary Teale. 69:21 Corner from right by-line taken by Jeroen Tesselaar. 69:13 Centre by Paul McGowan, Fraser Forster makes a save. 69:01 Short corner taken by Gary Teale. 68:54 Steven Thomson produces a cross, Du-Ri Cha manages to make a clearance. 66:53 The offside flag is raised against Lee Mair. Fraser Forster takes the free kick. 66:42 The ball is swung over by Jim Goodwin. 66:19 Paul McGowan takes a shot from 18 yards. Du-Ri Cha gets a block in. 65:48 Corner taken left-footed by Jeroen Tesselaar to the near post, Daniel Majstorovic makes a clearance. 64:53 The assistant referee signals for offside against Gary Teale. Fraser Forster takes the free kick. 64:25 Gary Teale decides to take the corner short. 64:13 Gary Teale produces a drilled right-footed shot from 25 yards. Daniel Majstorovic gets a block in. 60:24 Foul by Daniel Majstorovic on Steven Thompson, free kick awarded. Strike on goal comes in from Gary Teale from the free kick. 60:11 The assistant referee signals for offside against Gary Hooper. Indirect free kick taken by Jim Goodwin. 59:44 Free kick awarded for a foul by David van Zanten on James Forrest. Free kick taken by Charlie Mulgrew. 58:54 A cross is delivered by Charlie Mulgrew, Jim Goodwin manages to make a clearance. 58:39 Corner from left by-line taken by Sung-Yeung Ki. 58:21 Shot by Anthony Stokes. Save by Craig Samson. 58:08 Beram Kayal fouled by Steven Thompson, the ref awards a free kick. Direct free kick taken by Scott Brown. 56:51 Gary Hooper challenges Gary Teale unfairly and gives away a free kick. Paul McGowan restarts play with the free kick. 56:39 The ball is delivered by James Forrest, save by Craig Samson. Correction - 54:50 The referee blows for offside against Paul McGowan. Fraser Forster takes the indirect free kick. 54:50 The assistant referee signals for offside against Paul McGowan. Fraser Forster restarts play with the free kick. 50:28 Inswinging corner taken from the right by-line by Jeroen Tesselaar. 49:27 Foul by Kelvin Wilson on Nigel Hasselbaink, free kick awarded. Jeroen Tesselaar fires a strike on goal direct from the free kick, save by Fraser Forster. 47:44 Charlie Mulgrew sends in a cross. 47:19 Inswinging corner taken from the right by-line by Charlie Mulgrew, clearance by Steven Thompson. 47:06 Anthony Stokes takes a shot. Save by Craig Samson. 46:39 Sung-Yeung Ki gives away a free kick for an unfair challenge on Nigel Hasselbaink. Jim Goodwin restarts play with the free kick. 45:55 Free kick awarded for an unfair challenge on Steven Thompson by Beram Kayal. Direct free kick taken by Paul McGowan. 45:47 A cross is delivered by Du-Ri Cha, Jim Goodwin makes a clearance. 45:01 The second half begins. 45:00+0:16 The ref blows to end the first period. 44:52 Foul by Jeroen Tesselaar on Scott Brown, free kick awarded. Beram Kayal restarts play with the free kick. 44:13 Paul McGowan fouled by Beram Kayal, the ref awards a free kick. Direct free kick taken by Jeroen Tesselaar. 42:31 Centre by Jim Goodwin, clearance by Scott Brown. 41:45 The ball is delivered by Jeroen Tesselaar. 41:08 Anthony Stokes is ruled offside. Indirect free kick taken by Marc McAusland. 38:38 Unfair challenge on Paul McGowan by Beram Kayal results in a free kick. Direct free kick taken by Jim Goodwin. 36:52 Jim Goodwin produces a right-footed shot from outside the penalty box and misses wide left of the target. 36:35 Shot by Nigel Hasselbaink from 18 yards. Sung-Yeung Ki gets a block in. 36:21 Short corner taken by Gary Teale. 36:13 A cross is delivered by Jeroen Tesselaar, clearance by Kelvin Wilson. 34:25 Nigel Hasselbaink fouled by Daniel Majstorovic, the ref awards a free kick. Gary Teale crosses the ball in from the free kick, save by Fraser Forster. 33:18 Handball decision goes against David van Zanten. Free kick taken by Charlie Mulgrew. 32:42 Effort on goal by Steven Thomson from 18 yards. Blocked by Nigel Hasselbaink. 32:34 The ball is sent over by Steven Thompson. 31:08 The offside flag is raised against Anthony Stokes. Lee Mair takes the free kick. 30:22 Centre by Steven Thomson, clearance by Du-Ri Cha. 28:50 Nigel Hasselbaink concedes a free kick for a foul on Fraser Forster. Free kick taken by Fraser Forster. 28:18 Corner taken by Gary Teale from the left by-line to the near post, clearance by Fraser Forster. 27:45 Nigel Hasselbaink crosses the ball, save by Fraser Forster. 26:13 The ball is swung over by David van Zanten. 25:33 The ball is swung over by Nigel Hasselbaink. 23:21 James Forrest has an effort at goal from outside the area missing to the wide left of the goal. 22:38 Steven Thompson gives away a free kick for an unfair challenge on Charlie Mulgrew. Sung-Yeung Ki restarts play with the free kick. 21:52 Unfair challenge on James Forrest by David van Zanten results in a free kick. Charlie Mulgrew takes the direct free kick. 21:11 Charlie Mulgrew delivers the ball, Headed effort from inside the area by Gary Hooper misses to the left of the target. 20:40 The ball is swung over by Du-Ri Cha, David van Zanten manages to make a clearance. 19:37 Header from deep inside the penalty area by Steven Thompson goes harmlessly over the crossbar. 18:31 Inswinging corner taken right-footed by Gary Teale, Effort from 20 yards by Paul McGowan. Blocked by Steven Thompson. 18:26 A cross is delivered by Jeroen Tesselaar, Du-Ri Cha gets a block in. 18:00 Du-Ri Cha sends in a cross, Marc McAusland manages to make a clearance. 15:39 Jeroen Tesselaar takes a corner. 15:22 Paul McGowan takes a shot. Save made by Fraser Forster. 15:02 Anthony Stokes gives away a free kick for an unfair challenge on Jim Goodwin. Free kick taken by Jim Goodwin. 11:08 GOAL - Gary Hooper:St Mirren 0 - 2 Celtic Gary Hooper finds the net with a goal from deep inside the penalty box to the bottom right corner of the goal. St Mirren 0-2 Celtic. 9:44 Free kick awarded for a foul by Scott Brown on Jim Goodwin. Free kick taken by Jim Goodwin. 8:13 Jeroen Tesselaar concedes a free kick for a foul on Scott Brown. The ball is crossed by Charlie Mulgrew, Daniel Majstorovic has a header from inside the six-yard box and clears the crossbar. 5:57 Assist by Anthony Stokes. 5:57 GOAL - Gary Hooper:St Mirren 0 - 1 Celtic Gary Hooper scores a goal from inside the penalty box to the bottom right corner of the goal. St Mirren 0-1 Celtic. 3:03 Foul by Steven Thompson on Daniel Majstorovic, free kick awarded. Fraser Forster takes the direct free kick. 2:24 Nigel Hasselbaink fouled by Daniel Majstorovic, the ref awards a free kick. Free kick taken by Gary Teale. 1:58 Anthony Stokes gives away a free kick for an unfair challenge on Marc McAusland. Jim Goodwin takes the free kick. 1:15 Effort on goal by Anthony Stokes from deep inside the penalty area misses to the right of the goal. 1:04 Paul McGowan concedes a free kick for a foul on Beram Kayal. Scott Brown restarts play with the free kick.